Sometimes an automaker confound basically everyone when a new model proves successful despite the doomsday predictions of the media and other industry professionals. The third generation of the Sportage was a massive worldwide success for Kia, but it was a bold move to bring an entirely new look for the new fourth generation. 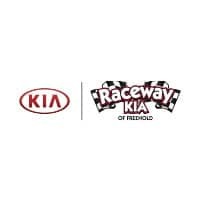 Now that 2018 is here, let’s see what this newest incarnation of the fourth generation offers buyers and Kia fans. Kia could have played it safe and stuck to the winning formula of the third generation Sportage styling, and in a way it did. The overall profile is similar, although it does have a somewhat sportier stance now. The rear is reasonably similar too, but the front of the 2018 Sportage bears very little resemblance to its predecessor. The new grille, the bug-eye headlights, and the ice-cube fog lights are more modern, more aggressive, and more distinctive. Even if you’re not sure at first, the look of the current Sportage will grow on you. Three different trim levels are available on the 2018 Kia Sportage, which is a considerably more compact lineup than Kia offers in other markets. The entry model to the range is the LX, the mid-range model is the EX, and the top-of-the-line trim level is the SX Turbo. The range starts off at just $23,500 for the LX, but it’s certainly no stripped-down base model by any means. Two engines cover the three trim levels of the 2018 Sportage range, with the standard engine powering the LX and EX models and the more powerful option reserved for the SX Turbo. The standard unit is a 2.4-liter inline-four that develops 181 horsepower, which is definitely plenty for most buyers in a crossover of these compact proportions. If you want to have the Sportage as sporty as it looks as though it ought to be, the SX Turbo and its 240 horsepower 2.0-liter turbo is the way to go. Whichever engine and model you opt for, a six-speed automatic transmission and front-wheel drive is standard, but all versions can be upgraded to Kia’s Dynamax fully active all-wheel drive if preferred. There’s no such thing as a sparsely equipped 2018 Sportage. 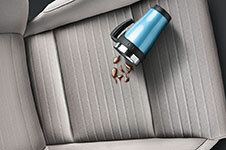 The LX comes standard with 17-inch alloys, LED daytime running lights, automatic lights, privacy glass, a rear spoiler, a six-speaker audio with a 5.0-inch touchscreen, a rearview camera, air conditioning, Bluetooth connectivity, and more. Moving up to the EX adds leather seats, the UVO infotainment system with a 7-inch touchscreen, Android Auto and Apple CarPlay, rear-camera display, rear cross-traffic alert, 18-inch alloys wheels and dual-zone climate control. The SX Turbo gets you just about every feature you could realistically expect for less than $33,000–and every single one of the Sportage trim packages gives you incredible value for your money. A turbocharged engine and 240 horsepower is just part of what makes the SX Turbo version of the 2018 Kia Sportage special. An exclusive chrome and black design extends throughout, accented by as many of the upgrades as Kia could squeeze into its top trim: metal skid plates, panoramic sunroof, Smart liftgate and key, 8-inch touchscreen, paddle shifters, and the entire cadre of advanced safety features. 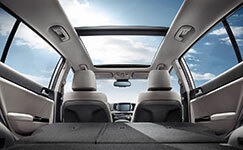 Bring the outside in with the panoramic sunroof, which is easy to use with the power sunshade option. If real people–and especially kids–ride in your Sportage, stain-resistant seat fabric will be one of your favorite features. 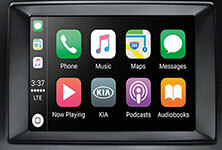 Apple CarPlay and Android Auto options mean that your smartphone can be integrated with your touchscreen to allow easy access to your apps, music, and podcasts. 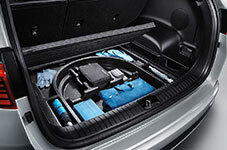 Keep your valuables stashed with the hidden cargo compartment in the back, which allows you to not only keep things hidden but also to have two levels of storage. If you like the way the 2018 Kia Sportage looks, and it’s hard to think why anyone wouldn’t, you really can have a sensational vehicle for not a great deal of money here. The LX has a great standard feature set for a very low starting price, and the large alloy wheels and other appointments give no hint of it being an entry model. The SX Turbo does cost considerably more, but the list of upscale features and equipment is almost endless, and really does put some luxury models costing twice as much to shame. You can’t go wrong with the 2018 Sportage, which continues to show why Kia is an up-and-coming powerhouse on the SUV market.